Your body has a built-in system designed to keep you healthy and vital well into your early 100s. If you understand how this built-in system works then you can live well, symptom-free, for most of your years. If you are symptomatic, you need to know that the body is still on automatic pilot to self-repair. If you are unhealthy, you will find healing by focusing on effectively turning on your body’s regenerative processes. Using your saliva as a diagnostic tool, you can implement individually appropriate changes to your life to reach optimal health. In general, saliva testing of the adrenal glands offers a powerful tool to evaluate gastrointestinal problems, stress-related and hormone-related diseases, and the overall wellness of the human body. The human adrenal gland does not secrete its steroid hormones at a constant level throughout the day. The hormones are actually released in a cycle with the highest value in the morning and the lowest value at night. This is easily understood by looking at the graph below. 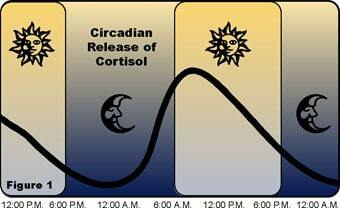 This 24-hour cycle is called the circadian rhythm. An abnormal adrenal rhythm can influence many functions of the body, some of which are listed below. The maintenance of a stable blood sugar level depends on food choice, lifestyle, adrenal function and insulin activity. This panel measures stress hormones and insulin, to help ferret out causes offatigue, cravings and obesity.